Product Availability: Orders normally ship within 1-2 business days. 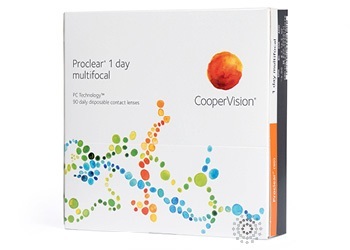 Proclear® 1- Day Multifocal contact lenses, manufactured by CooperVision® using PC Technology™ and offered in this 90 pack format, belong to a family of lenses that carry an FDA claim that they may provide improved comfort for contact lens wearers who experience mild discomfort or symptoms relating to dryness during lens wear. The PC Technology™ produces lenses from a biocompatible material that attracts, and has a high affinity to retain water within itself. This translates to exceptional all-day comfort for the wearer. The Proclear® 1- Day Multifocal will feel moist throughout the day. 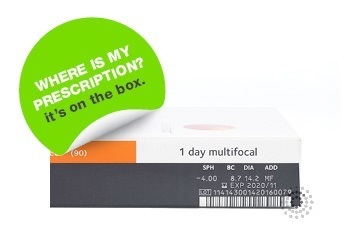 These lenses are prescribed for the correction of presbyopia and provide the convenience of daily disposable lenses. This wearing modality means you take the lenses out each night and replace them with fresh new lenses the next day. Be sure to follow your eye doctor’s recommended replacement schedule.